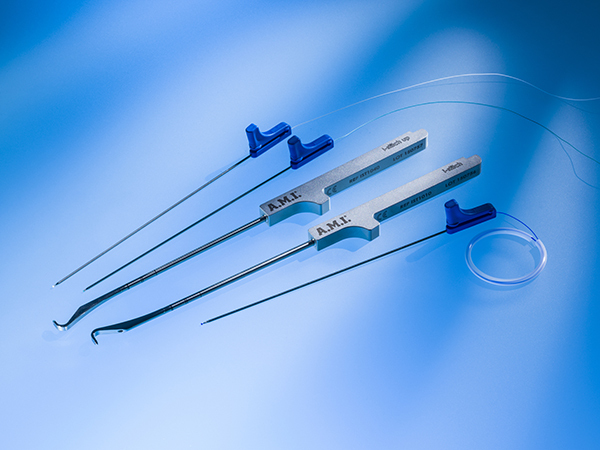 The i-Stitch facilitates the attachment of sutures to structures that are difficult to reach without extensive dissection e.g. the medio-cranial aspect of the sacrospinous ligament. Using the forefinger, the surgeon guides the i-Stitch into the desired position. The tip of the instrument is then pushed into the ligament. By applying gentle pressure with the thumb, the tip of the loading unit is pushed all the way through until a click can be heard. With the suture firmly attached to the tissue, the loading unit is drawn back and the instrument tip pulled away from the site. The suture stays in position.